A lovely, scenic walk through the Kent countryside, which began and ended at Sevenoaks and took in two historic National Trust properties, Knole House and Ightham Mote. After a short walk through Sevenoaks town centre, our route crossed Knole Park before heading off through typical Kent countryside to the village of Godden Green. The walk continued past oast houses, through orchards and into more woodland before descending to Ightham Mote (a Tudor moated manor house), where we stopped for lunch. At Ightham Mote we joined the Greensand Way, which follows the crest of the Greensand Ridge and provided superb views south across the Weald as we headed back to Knole Park. Finally as we continued through the deer park, we got a closer look at Knole House before heading back into Sevenoaks and on to the station. It felt like spring had finally arrived as we assembled outside Hemel Hempstead railway station. 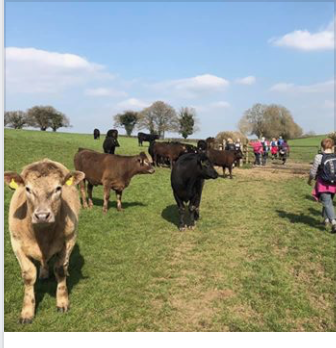 It was quite warm when standing directly in the sun, birds could be heard trilling away, the grass on the water meadows had been cut and one or two of our group were complaining about the onset of hay fever! 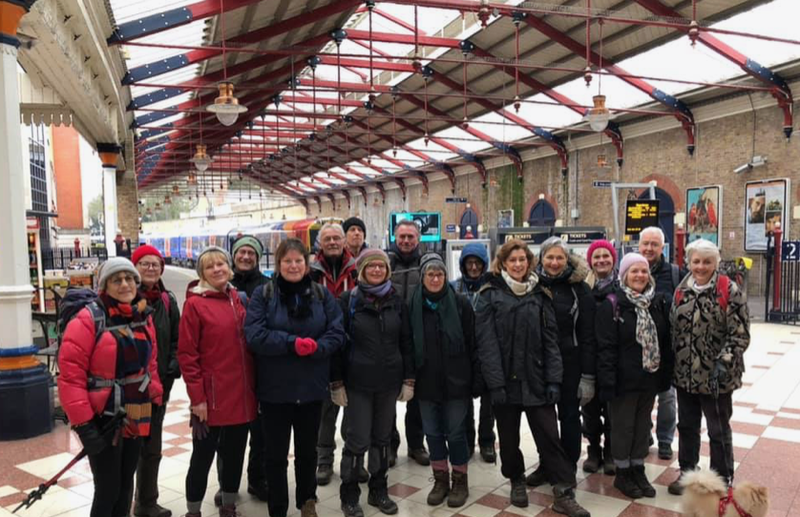 Immediately after leaving Hemel Hempstead station we joined the Chiltern Way, and followed it to the south-west towards the village of Bovingdon. From here the route turned due south, and after a stretch along Holly Hedges Lane entered Woodman’s Wood. By now we were almost two hours in and thoughts were turning to lunch which thankfully was not too far away. We had gradually turned to face east and soon after entering Chipperfield Common, arrived at our planned lunch stop at The Windmill. Describing itself as ‘a traditional village pub’, it certainly lived up to that description, providing a warm welcome along with our food and drink. Fully refreshed we crossed the common and joined the Hertfordshire Way, which entered pasture land after leaving the woods. we continued through fields to cross the A41 and descended through the outskirts of Kings Langley to join the Grand Union Canal. Here we turned north and followed the canal towpath back to Hemel Hempstead and the train to London. The days leading up our Knebworth Circular walk had been unseasonably warm, but the day of the walk itself was overcast and showery. Surely this change in the weather was not due to the fact that we were missing our companions (currently enjoying an antipodean adventure) who always seem to have the ability to summon up brilliant sunshine on walk days? This was a relatively undemanding walk along the footpaths and bridleways of the Hertfordshire countryside, starting from Knebworth station, circling an area around Knebworth House and ending at Stevenage. The first of the day’s showers arrived just as we arrived at our lunch stop, The Lytton Arms, next to early 19th century almshouses in the picturesque village of Old Knebworth. The pub – highly recommended for its speed and efficient on the evidence of this visit – has adorned its gentleman’s toilets with framed posters promoting the famous Knebworth rock concerts and this evoked a few memories of Status Quo and Queen and other luminaries of the 1970s. Our post lunch walk took us into Knebworth Park where we passed the Grade II* listed Knebworth House and the nearby Knebworth parish church with its flèche or “Hertfordshire spike”; then on through Graffidge Wood and farmland (where we were greeted by a pair of friendly pigs) to the village of Langley. At this point it started to rain quite heavily so we hurried through the business parks and gloomy underpasses of Stevenage to the station for a welcome cup of tea before the journey home. Once again, an impeccably arranged walk! 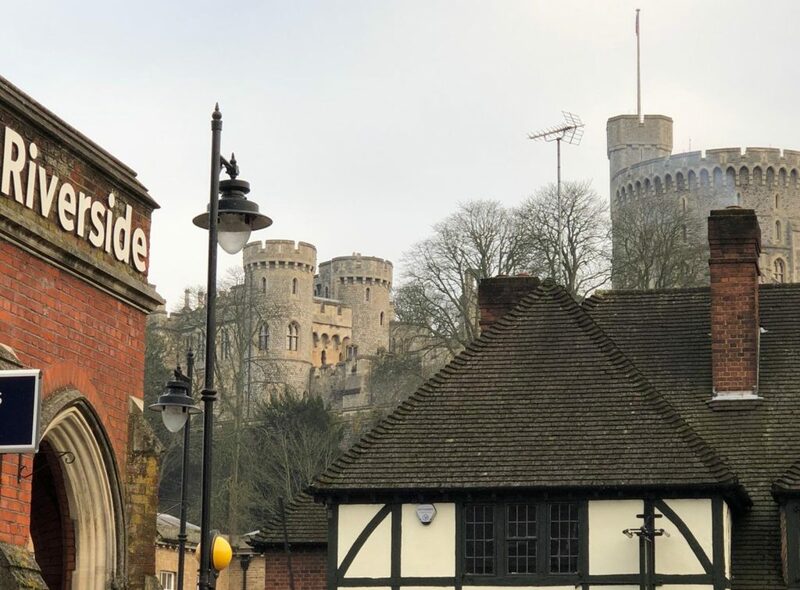 Our first walk of 2019 started in Windsor on a cold and crisp morning, perfect for a brisk stroll. After crossing the Thames from Windsor Riverside Station, we followed the Thames Path westwards to Dorney Lake. The private property of Eton College, the ‘lake’ was used to host canoeing and rowing events in London 2012, and became the fourth Olympic venue ‘longer walks’ have visited. (The others are: Box Hill – cycling road race, Hadleigh – mountain biking and Stratford’s Copper Box – handball/fencing). Our way continued along the Thames, past the settlement of Bray on the opposite bank and beneath the roar of the M4, before we cut across farmland to reach the Jubilee River. Although the Jubilee is in fact a flood alleviation channel, it provided an attractive waterway to walk alongside, despite being on the borders of Slough! As lunchtime approached, we took a short detour from the river bank into the village of Dorney, and refreshments at The Palmer Arms. Suitably fortified we crossed a spinach field to return to the Jubilee River. Turning to face east, we headed towards Eton, meeting as we did so a pack of friendly beagles, which we were informed were the ‘Eton Hounds’ by a very polite young man with a hunting horn around his neck, who appeared to be in charge of them. Arriving at the town, our final stretch took us south through the Eton College quarter, before we met the High Street and headed back to the end of the walk on Eton Bridge.